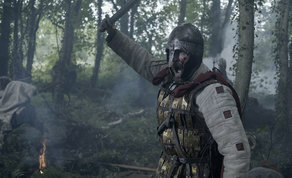 The successful Tile Films series received four awards at NAB in Las Vegas across both ‘Sacred Sites: Egyptian Priestesses’ and ‘Sacred Sites: King Arthur’ at the awards on April 9th. Tile Films won the Gold Medal for best docudrama for ‘Sacred Sites: Egyptian Priestesses’. Director Stephen Rooke was awarded a Silver Medal for best direction, while editor Jim Dalton was awarded a Silver Medal for best editing. Meanwhile, another Tile Films documentary, ‘Sacred Sites: King Arthur’, won a Gold Medal for best History & Society documentary. With Stephen Rooke and writer David Ryan away in Cannes attending MIPTV, Jim Dalton and audio mixer Killian Fitzgerald took to the Las Vegas red carpet to collect the awards on behalf of Tile Films. It was a huge success for the Dun Laoghaire-based production company and comes on the back of extremely high ratings following the recent broadcast of the films on the Smithsonian Channel in North America. ‘Egyptian Priestesses’ and ‘King Arthur’ are episodes in Season 2 of ‘Sacred Sites’ series, an acclaimed 4K UHD docudrama series produced by Tile Films for the Smithsonian Channel. Based on new archaeological and historical discoveries, cutting edge scientific research, expert analysis, and groundbreaking theories, ‘Sacred Sites: Egyptian Priestesses’ offers a fascinating new perspective on Egypt’s sacred temples, tombs and monuments and the people who built them. The film reveals a surprising undercover power structure in ancient Egypt, led by women: an elite succession of priestesses called the God’s Wives of Amun, who wielded extraordinary influence. Until recently they were all but forgotten, but in this documentary, experts investigate Egypt’s sacred sites to rediscover their story and the mysterious source of their power. Filmed on location in twelve countries, ‘Sacred Sites’ Season 2 was directed by Tile Films’ Managing Director Stephen Rooke (‘Aerial Ireland’, ‘Saving the Titanic’) and Ruán Magan (‘Wrecking the Rising’, ‘The Men Who Built America’) Tile Films’ Head of Development, David Ryan (‘After Braveheart’, ‘Cromwell in Ireland’) developed and was creative producer on the series and writer of three episodes. The series producers were Stephen Rooke and Laura Danaher (‘Death or Liberty’). Directors of Photography were Mick O’Rourke, Colm Hogan and Piaras Mac Cionnaith. Sound Recordists were Michael Cassidy and John Brennan, while audio mixing was conducted by Killian Fitzgerald of Avatar Audio Post Production. The series was edited by Jim Dalton, Keith Walsh and Janice Toomey. Post production was provided by Outer Limits with Eugene McCrystal as colorist, Rory Gavin as online editor, Andy Clarke and Kevin O’Brien in charge of VFX. Music composers were Giles Packham, Ray Harman and Damien Walsh. The production designer was Lynne Williams of Irish Arms and Maeve Kenny and Maggie Fagan were production managers. The drama re-enactments were filmed in Ireland and Morocco. ‘Sacred Sites’ Season 2 is produced by Tile Films for the Smithsonian Channel. Stephen Rooke is executive producer for Tile Films, while David Royle and Tim Evans are executive producers for Smithsonian Channel. Reaching over 30 million households in the U.S. and Canada, ‘Sacred Sites’ Season 2 was first broadcast on the Smithsonian Channel in August and September 2018.